Dentists at Smiles LA, dental office in East Los Angeles, warn about mouth cancers in women. East LA dental office, Smiles LA, warns women about the risks of oral cancer. Oral cancer rates have dramatically increased, and experts are predicting that oral cancer will be more prevalent than cervical cancer by 2030. Both cancers are linked to HPV, or the human papillomavirus, a common sexually transmitted infection. Although most healthy people clear HPV without further incidence after infection, 4 percent of the population carries HPV-1, the high-risk strain associated with cancer. The risk is also higher in those who are over 45 and those with fair skin. For women, the lifetime risk of being diagnosed with oral cancer is one in 150. While oral cancer is not one of the most common cancers, it is among one of the most dangerous. The five-year survival rate is about 40 percent. Early diagnosis through regular screenings may help boost survival rates to 90 percent. Symptoms of oral cancer can vary but may include white or red patches, unusual lumps, swelling, or ulcers that do not heal within three weeks. Drs. Michel Elyson and Ramin Assili offer comprehensive dental care at Smiles LA. Dr. Elyson is a popular East LA dentist and a member of the California Dental Association, the Academy of General Dentistry, the American Dental Association and the San Fernando Valley Dental Society. A graduate of California State University, Northridge, Dr. Elyson completed his dentistry degree at UCLA and his residency at the Misch Implant Institute. He has since served at UCLA as a clinical instructor and is a fellow of the International Congress of Oral Implantologists. Dr. Assili is also a graduate of California State University Northridge. After completing his DDS at UCLA, he graduated from the Misch Implant Institute and was accepted as a fellow at the International College of Implantologists. 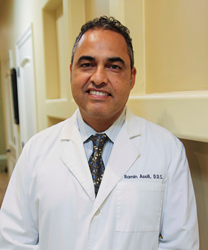 Today, Dr. Ramin Assili is a member of the Los Angeles Dental Society, the California Dental Association, the Academy of General Dentistry and the American Dental Association.